“What do you see out of that window? People, right? Just people. So says a character in Pandora’s Box, a brilliant new play by Ade Solanke which succinctly examines the issues of identity, location, parenthood, and the choices that can make or break lives. 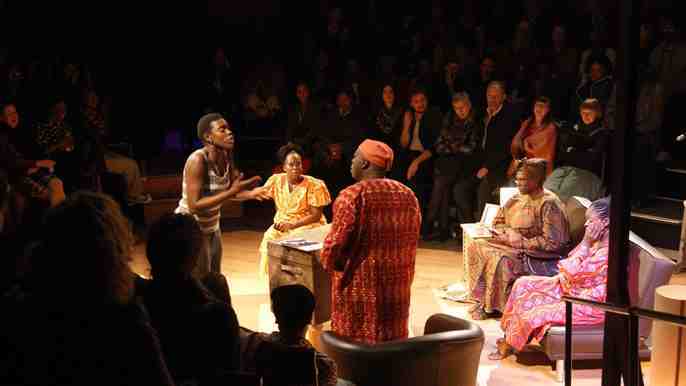 The play takes place in a Lagos living room and revolves around a family that is spread between London and Nigeria. Pandora (played by veteran thespian, Susan Aderin) is the mother of Toyin and Ronke. Whilst Toyin (Anna-Maria Nabirye) grew up with ‘her’ mum in London, Ronke (Yetunde Oduwole, Mrs Adebanjo from sitcom ‘Meet the Adebanjo’s’) was raised by grandparents in Nigeria whilst Pandora and her husband were studying in England and then like so many of us got stuck. Toyin and Pandora have come to visit Nigeria for the first time since then with Toyin’s Antiguan not-Jamaican friend Bev (superbly played by Petra Letang, formerly on Eastenders) and Toyin’s 15 year old son Timi (played by first timer Bradley John). Timi is a typical inner London youth, over indulged by his mother but sinking deeper and deeper into London’s gang life, the family has decided he is to attend a prestigious boarding school in Nigeria in order to ‘sort him out’, but Toyin is having last minute cold feet. In the meantime, big sister Ronke is still nursing a deep grudge against Pandora for abandoning her and against her junior sister for being the one favoured with her mother’s attention. Pandora feels guilty for abandoning Ronke and for not coming back with her qualifications, while Bev has met a ‘fine Naija man’ (yes I know what you’re all thinking!) who has swept her off her feet and she is thinking of relocating to Nigeria. And in the middle of it all is Pandora’s ‘box’ her trunk which she brought back from England which she has been packing and filling since she departed. Without spoiling the plot, this is excellently written and brilliantly acted out. It covers the thorny issues of identity, parenthood and culture from all the angles, from a mother’s anguish, a child’s bitterness, and sense of abandonment; the agonising choices a parent faces in trying to do the right thing. For those of us for whom this was actually our life story (leaving the UK for boarding house in Nigeria, to become the resident aje butter and realise the horrors of fetching water and cutting grass! ), the play neatly encapsulates the idea behind my “Born in the UK, Made in Nigeria” brand although this was an extremely positive and life forming experience. A particular scene between Timi and Tope (Damson Idris a drama student at Brunel) his friend from London who had made the transition to Nigerian school boy and was making a marked improvement reminds us of how difficult it can be. All in all, Pandora’s Box is a brilliant play that addresses a pertinent issue not just of education and the role of culture and identity of parenthood and that bad choices can be made with the best of intentions. Ade Solanke is a British Nigerian playwright (one of 3 female British Nigerian playwrights with plays currently running in London) and this hit was inspired by Waryla Abrahams, a teacher who struggled with these issues with her son, who was unfortunately on a downward spiral. Her story has a happy ending though as her son is now an undergraduate studying business entrepreneurship after returning home to school. Pandora’s Box is directed by Ola Animashawun, Assistant Director Moji Kareem. It also features Ben Onwukwe (London’s Burning) playing Principal Osun, Tunji Sotimirin a lecturer at UNILAG currently on sabbatical at Goldsmiths College plays Baba, Pandora’s brother. The play runs until 26 May at Arcola Tent, performance time is 7.30pm (matinee 3.00pm), tickets are £14 (£10 concessions).